Hello, friends and thanks for stopping by today as I share a sweet little card I made for Really Reasonable Ribbon. I used some super cute nostalgic papers, ephemera, stickers, chipboard, and a journalling/decorative card (carousel) and yellow sentiment sticker strip from October Afternoon ephemera packet. I also added lots of great ribbons to my card just to add some fun. 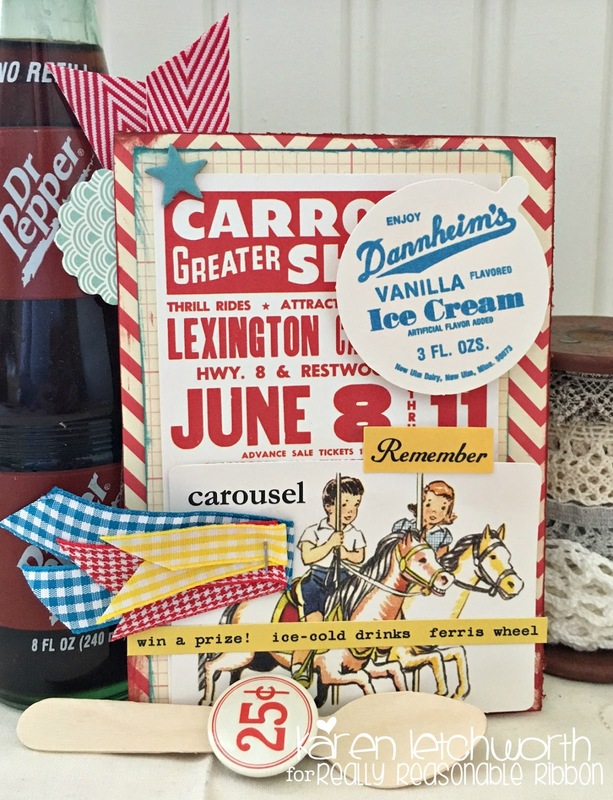 I love this nostalgic, retro look, and Really Reasonable Ribbon has the perfect trims for this and any style of project. I just love how I can always find the perfect trim for each project I create, and you will too. Go on, and give Really Reasonable Ribbon a try. I assure you that you won't ever be disappointed. These trims are products are absolutely LOVELY! At the top left of my card, you will see a circular piece of ephemera (half or so tucked under card), and a snippet of 3/4" Red Chevron Stripe Twill. Then, down at the bottom left part of my card you will see pieces of Plaid Turquoise Ribbon, 3/8" Yellow Gingham Ribbon, and Red and White Plaid Houndstooth Ribbon. I just love how all these different ribbons work together so nicely and compliment one another. The ribbons really brought my card to life and gave it texture, depth and personality. Oh, and I don't want to forget to tell you all that I use LOTS of Scor-Tape to hold my cards together. It's a fabulous, long-lasting adhesive. Be sure to stop by the Really Reasonable Ribbon Store to check out the ribbons I used (all listed and linked above....just click on the ribbons you'd like and add them to your cart). 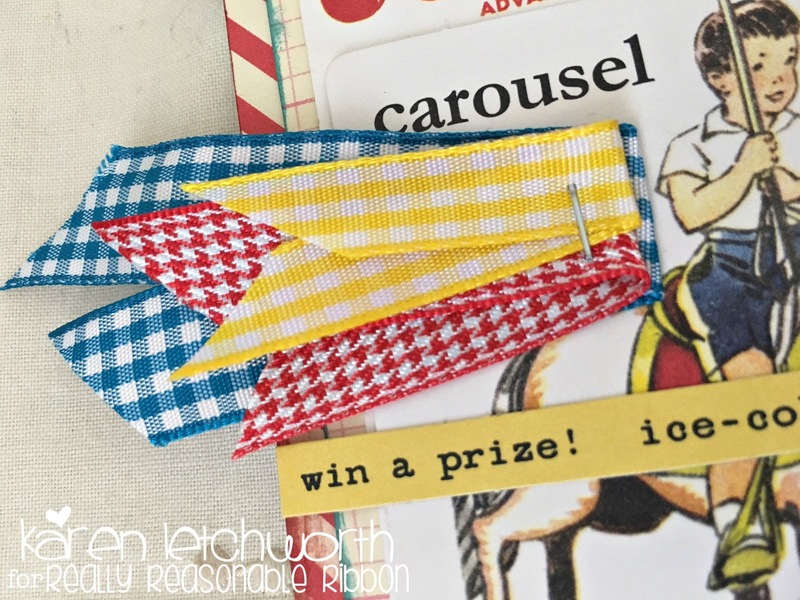 AND - there's also a fabulous challenge taking place right now, so come play along in our Current Challenge And finally, there's always lots of great inspiration over on the Really Reasonable Ribbon Blog. Be sure to stop by often for inspiration, special sales, shopping, challenges, and SO much more. Simon Says Stamp Wednesday Challenge Blog - Simon Says Use Patterned Paper - I used various October Afternoon patterned papers on this fun nostagic card. Fun card! 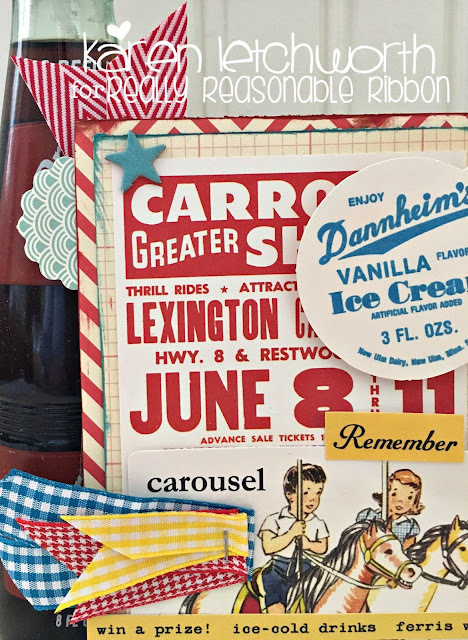 Your stapled snippets of ribbon add a vintage touch -- nicely done! What a fun retro card, Karen! The trims are so pretty! wonderful vintage feel. Great papers and embellishments. What a great memory evoking card! When we were kids, we loved go to the fair. 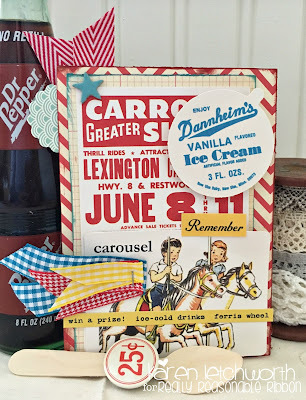 Your vintage paper and elements are great and the layout and ribbon are fantastic!